De-cluttering and reclaiming space in your garage is easier than you might think. We have a variety of different garage cabinets, wall, bike hangers and overhead storage options that will help you to utilize your garage for both storage and parking your automobiles. At the end of the day utilizing the garage as a dumping ground is bad for not only finding things but also it isn't good to have your cars parked outside of the garage in the hot Naples sun. Our professional designers can help you maximize storage cabinets for golf clubs or holiday decorations. Or you might be in the market for a perfect workbench area or a garage mudroom type area with lockers for each family member. We can help you create a great garage space where it all happens and also make it easier for you to keep it looking great! Heavy duty garage cabinets boast modern cabinet fronts with a full back panel and thick sturdy shelves. Our custom cabinetry keeps your possessions elevated and safe from damp floors all the while maximizing garage space. We also provide overhead storage and non-cabinet wall-storage solutions including storage hooks, racks and plastic bins. All wall accessories are moveable and lock into place on our wall storage systems. So if you are looking to maximize your garage space please contact us to schedule a free design consultation. from a vast array of finishes: wood, laminate, glass & metal. with 3D computer rending services. impeccable installation and timely service. 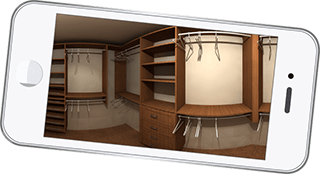 Your new custom closet can be viewed in home, on your phone. At PLC Closets, we care about the environment not just your living environment, but also our great outdoor ecosystems. 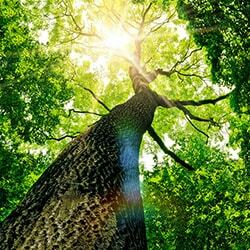 We believe in informing our customers about the carbon sink properties of our wood-based panels. We only use materials formulated to reduce greenhouse carbon emissions specifically, 100% recycled and recovered wood fibers. PLC Closets is devoted to maintaining compliance with the most stringent third-party certifications for good indoor air quality.